progress | hair, there and everywhere! Length Check and Happy 18 Month HHJ! I have not done one of these (officially) since April! Since my hair is not to be straightened until my relaxer in about 6 weeks, I thought that I would just stretch the longest layer and see where I am at! 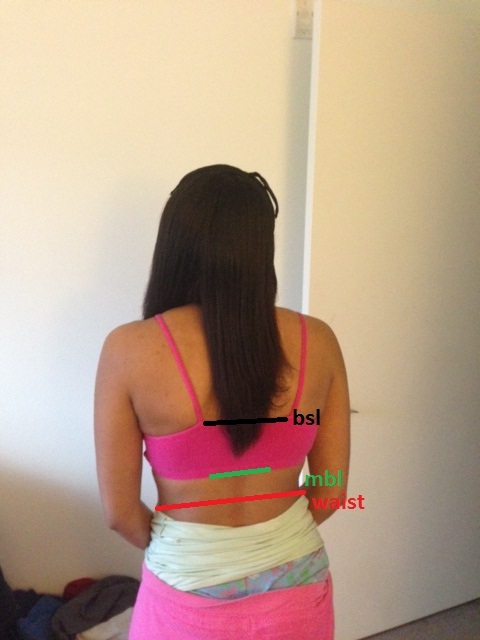 As you can see, I am half-way between BSL and MBL back in April and now my longest lengths (if they were flat ironed) would be right at MBL. Progress is continuing to be made! Halleujah! And because my 18 month anniversary of my HHJ has come and gone (it was July 9th), I wanted to take a look where I was in January 2012, July 2012 and now … . I went from shoulder length to chasing MBL in 18 months, which is about 9 inches (3 to 12 on my length check shirt). 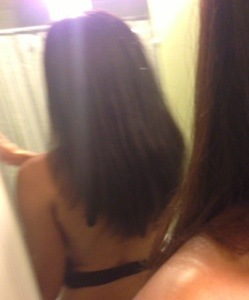 That means I grew and retained exactly .5 inches every month. Of course that doesn’t count the dustings and hair that has broken off … I always knew my growth rate was slightly higher than the .5 average. And for good measure, I am throwing this picture in from February 2012 – I remember I was so proud of my hair being this length! LOL! Hey … we all have to start some where, ya know? I don’t think I will be waist length until next spring. 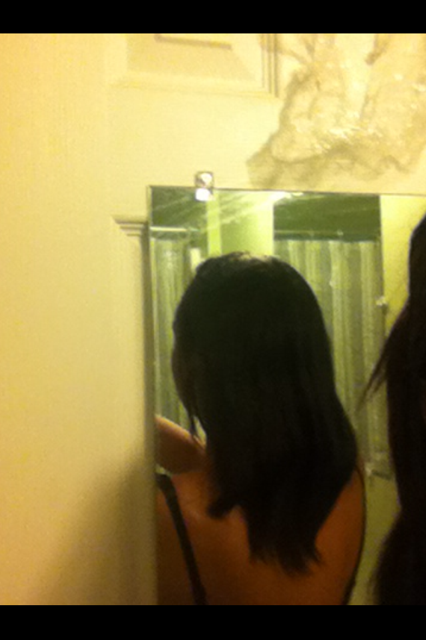 I have about 3.5 inches to go in my longest layers, which is at least 7 months of growth. 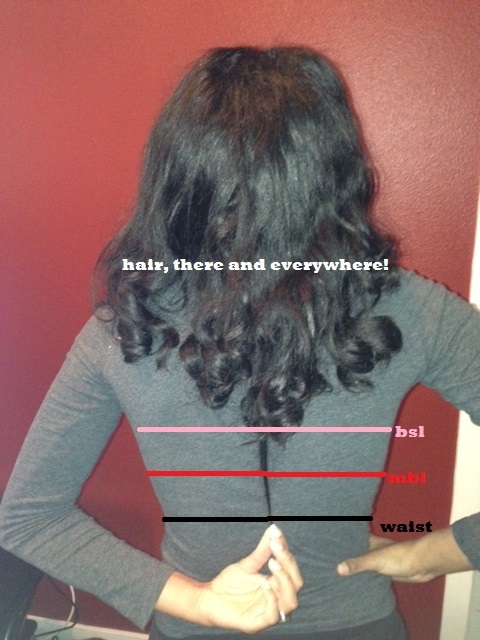 Maybe I will be there for my February 2014 relaxer … we shall see! HAPPY ONE YEAR HHJ ANNIVERSARY! Monday, January 9th, 2012. That was the official start day of my HHJ. That was when I started protective styling and reducing the amount of heat that I used on my hair. I cannot believe that it has been one year since the beginning of my hair journey. I am just astounded about how fast time has flown! I was wondering what to write on this momentous occasion and was inspired by Carolyn over at Waist Length Wishes. 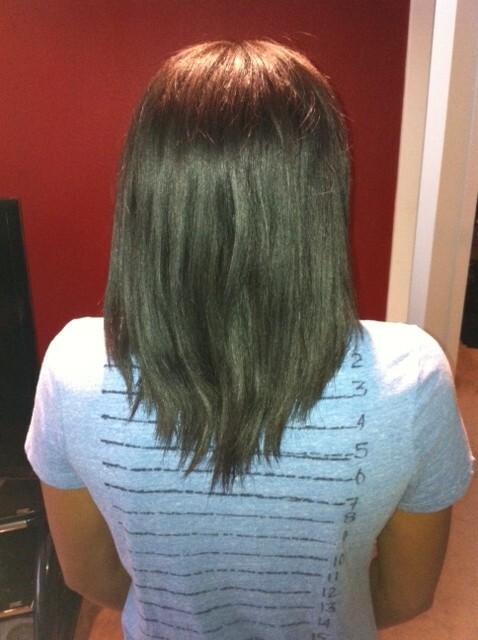 The post was a reflective piece on her 4 year hair journey and the things she discovered that did not work for her. I was like a-ha! That’s a great reflective prompt!! Thanks to her for thinking about it! 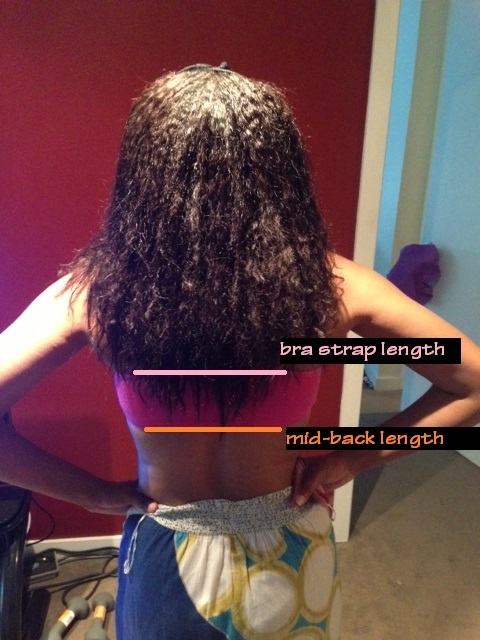 A quick comparison of lengths! I remember that when I first started my hair journey, I was hungry for information and resources. I read blog posts and forums and saw how the wonderful results these people had, so of course, I started spending money and time trying all these things out. I can honestly say that with the exception of a few tweaks here and there, the products that I used pre-HHJ are still the ones I use for the most part today. Here are some things that did work for me and some that did not! Coconut Oil – Using coconut oil by itself yielded bad results for me. 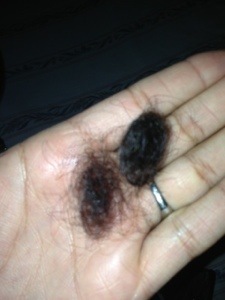 My hair became dry, brittle and broke off when I sealed my ends with it. NJoy’s Sulfur Mix – This concoction may have worked for her, but it did nothing for me. Not only was it thick and weighed my hair down, it had a horrible smell. I did not yield great results from it, so I abandoned it late spring. 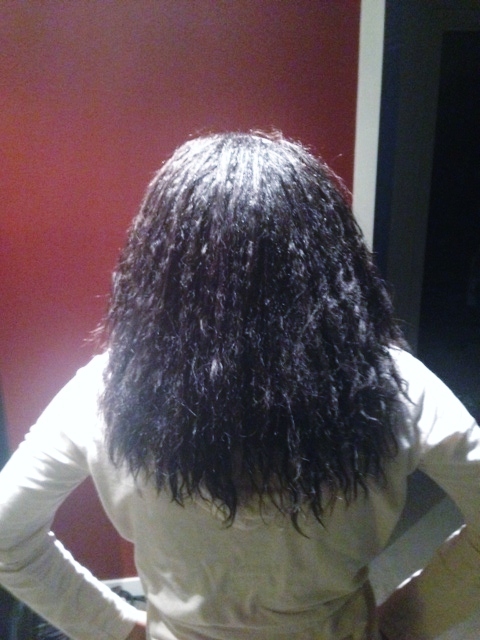 Baggying my ends – I did this roughly for two weeks. My hair became mushy instead of moisturized. I quickly threw it out of my routine. 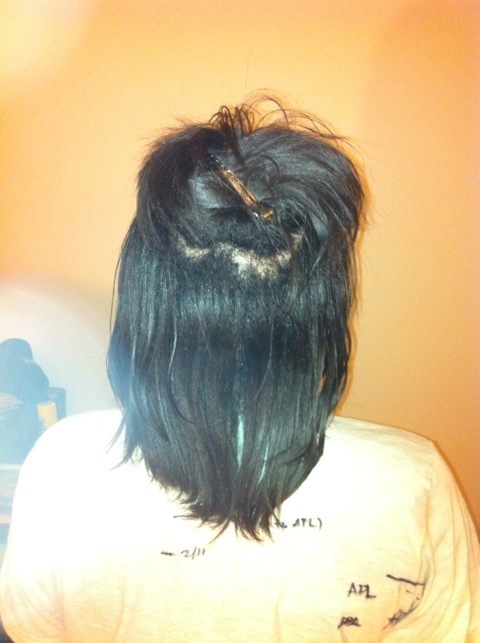 Saran wrapping hair after roller setting – I know some sistas can do this and get sleek results, but I cannot. When I put a bit of moisture and oil on it, then wrap it up and tie it in saran wrap, it puffs up. I have even tried it with just oil to prevent my hair from reverting, all to no avail. 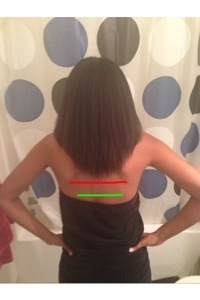 If I want to wrap my hair after a roller set, I just tie it down with a scarf and unwrap it the following morning. Country Life Maxi Hair Time Release vitamins – Early in the journey I fell for the supplements-can-make your-hair-grow bit. I am sure they can, but these damn vitamins caused me daily headaches! I think it may have been the niacin or biotin doing it, but I could not take them. Since then, I only take my daily supplement gummies and my fish oil/omega 3s. Activators as Daily Moisturizers – I was very surprised to see sistas with great results using curl activators as daily water-based moisturizers such as S-Curl and Wave Noveau, as these were products I associated with the elderly women at church who still had their jheri curls! I tried Hawaiian Silky 14-n-1 curl activator, but it did not do well on my hair. I just went back to my beloved Alterna Caviar White Truffle Elixir last February and have used it ever since. Airdrying – I did this a lot in Hawaii, just because it was so hot and I sweated a lot in my head and it needed frequent cleansing. Now that I am doing this as a part of HHJ, it has renewed significance for me! It saves me time while giving my hair a much needed heat break! Hot Oil Treatments (Pre-Poos) – At first I was like, what the heck is the point of this?, but I can definitely feel a difference in my hair and scalp when I implement this into my regimen. I feel that my hair has more condition now and I never get dandruff or an itchy scalp. 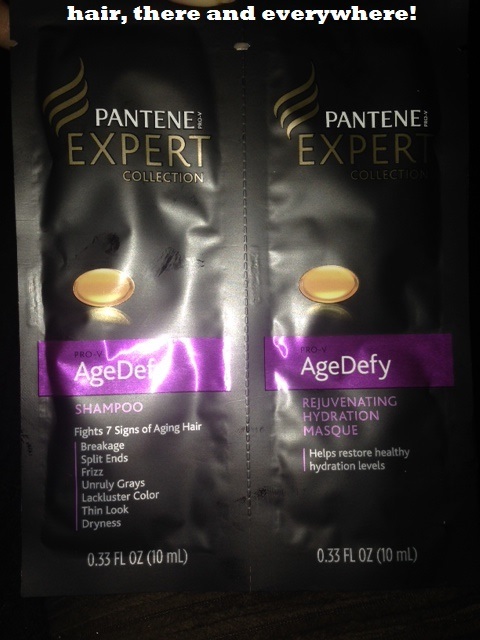 Deep Conditioning – Now the only time I deep conditioned pre-HHJ was at the hair salon. I would throw conditioner in my hair in the shower, leave it on for 5-10 minutes, then rinse it out. I knew I needed to do better about conditioning my dry hair, but I was just too lazy … now, I cannot do without deep conditioning! 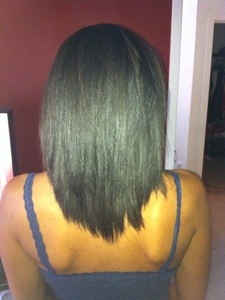 I love it and my hair has thrived since including them in my regimen. I do one each week! 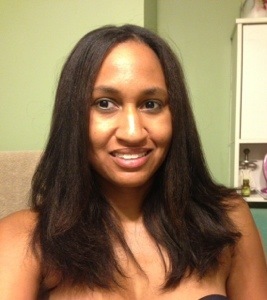 Heat Breaks – Pre HHJ, every week I would blow dry and flat iron my hair. 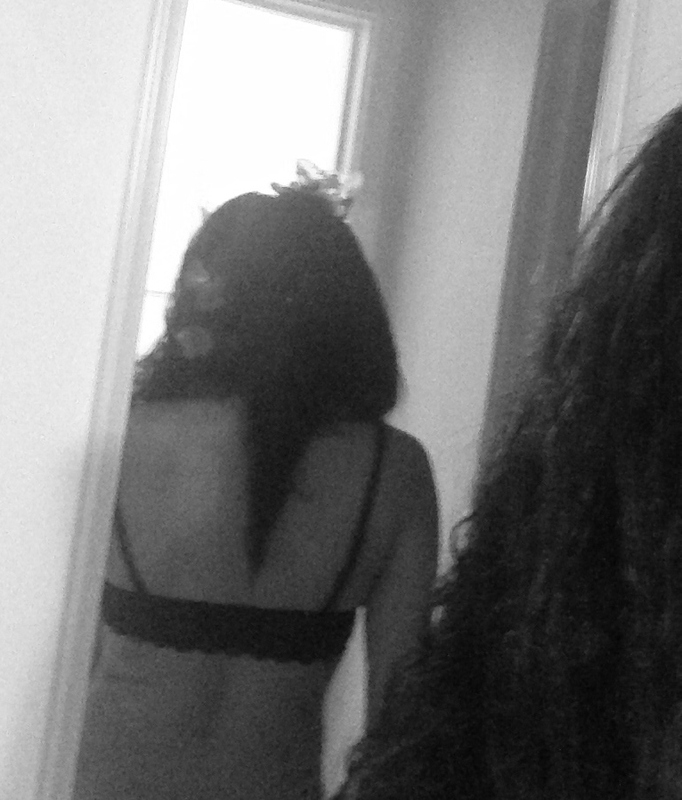 I see how my ends act when I get my hair flat ironed once every few months by breaking off … I don’t even want to imagine what I was doing to my hair back then! I would see the floor littered with pieces of hair, but I thought nothing of it and kept on doing my thing! SMH! Today I went to Sally’s to renew my membership. I wanted to wait until it was my HHJ to do so! It seems like yesterday I went into the same Sally’s buying rollers, clips, Roux, spray bottles, bottles with nozzles, etc. to start my hair journey! I also got a free Ion or Silk Elements product with my renewal, so I went with the Ion Extreme Moisture Cream (review forthcoming!) as well as a $5 off coupon for my next product. I think that I will use it for the Roux Porosity Control conditioner, as I am almost out! Well, happy first anniversary to me (and my hair!) 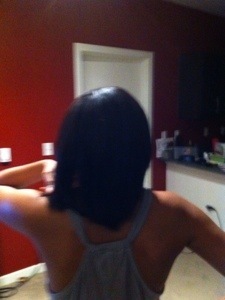 I went from full shoulder length to right at BSB in a year. By my measurements, I have retained between 4.5 and 5 inches of hair this year (from about 3.5/4 on my length check shirt to 8.5). It has been a wonderful journey thus far and I can’t wait to see what the next year on this journey brings (Full BSL/MBL would be nice)!